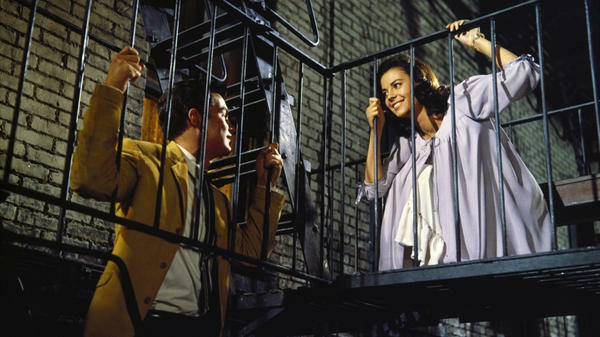 'Tonight' Music: Richard Beymer and Natalie Wood played Tony and Maria in the 1961 film of West Side Story. Time now for a home video recommendation from movie critic Bob Mondello. This week he's looking back a half-century, to a ground-breaking musical that won ten Oscars, West Side Story. Clean-cut delinquents and pressed jeans — giggle all you want, you know the moves. Finger-snaps, switchblades, Romeo And Juliet as a gang war pictured in colors that wouldn't be out of place in Bollywood. The streetscape's real, the acting and lip-synching crazily artificial. In 1961, West Side Story was thought shattering; today the Glee version looks tough by comparison. Still, this is the one that broke the mold — first on Broadway, then at the movies, where the trick was to make it feel real and still let it sing. Watch how Jerome Robbins eases dance moves into the movie's start: A bunch of hoods walking down the street, snapping fingers like they might in any movie. Then you notice a shoulder roll, two guys turning their heads at the same time, an arm stretching, then a leg, and before you know, it they're all soaring. In commentaries, producers remember how even after the two-year Broadway run, everybody was still claiming Leonard Bernstein's music was unhummable, Stephen Sondheim's lyrics too tricky. But just weeks after the movie came out, "Maria," "Tonight," "One Hand, One Heart" and other songs felt like standards. Among the four-disc set's Blu-ray extras: Stephen Sondheim knocking his own lyrics as overly writerly, and a whole documentary focusing on the film's legacy — everything from a solo harmonica version of the score to the spoof West Bank Story, which turns Anglos and Puerto Ricans into Arabs and Israelis. A few people recall seeing Punk Side Story, and then of course there's Glee, spending most of this season so far in a multi-show buildup to their high-school production of West Side Story,, timed to peak just as the 50th anniversary DVD is released — an unsubtle but impressive bit of product placement for Fox Home Entertainment, right there on Fox TV. Finally, this hour, a home video recommendation from our movie critic, Bob Mondello. This week, he's looking back a half century to a groundbreaking musical that won 10 Oscars, "West Side Story." BOB MONDELLO, BYLINE: Clean cut delinquents and pressed jeans. Giggle all you want. You know the moves. MONDELLO: Finger snaps, switchblades, Romeo and Juliet as a gang war pictured in colors that wouldn't be out of place in Bollywood. The streetscape's real, the acting and lip-syncing unbelievably artificial. In 1961, it was thought shattering. Today, the "Glee" version looks tough by comparison, but this is the one that broke the mold - first on Broadway, then at the movies, where the trick was to make it feel real and still let it sing. Watch how Jerome Robbins eases dance moves into the movie's start. A bunch of hoods walking down the street, snapping fingers like they might in any movie. Then you notice a shoulder roll, two guys turning their heads at the same time, an arm stretching and a leg and, before you know it, they're all soaring. MONDELLO: Believe it or not, after two years on Broadway, everyone was claiming Leonard Bernstein's music was unhummable, Stephen Sondheim's lyrics too tricky. But just weeks after the movie came out, the songs were all standards. MONDELLO: Among the four disc set's blu-ray extras, Stephen Sondheim knocking his own lyrics. STEPHEN SONDHEIM: In "Tonight," I like to quote - today, the world was just an address, a place for me to live in. That's such a writer's line. You can't believe the guy, particularly an ex-leader of a gang, is saying - is singing that. You know, that's very writerly. MONDELLO: Also, a documentary focusing on the film's legacy, everything from a solo harmonica version of the score to the spoof, "West Bank Story," which turns Anglos and Puerto Ricans into Arabs and Israelis. And a few people recall seeing "Punk Side Story." UNIDENTIFIED MAN: You hear "One Hand, One Heart" at warp speed. Make it one hand, one hand, make it one heart, one heart. It's pretty incredible. MONDELLO: Not to mention "Glee," spending most of the season so far in a multi-show buildup to a high school production of "West Side Story" cleverly timed to peak just as this 50th anniversary DVD is released, an unsubtle, but impressive bit of product placement for Fox Home Entertainment on Fox TV. (SOUNDBITE OF MOVIE, "WEST SIDE STORY") Transcript provided by NPR, Copyright NPR.